Is it time for the 'Immigrant Diet'? Douglas Cheok is a Chinese-Malaysian immigrant who cooks affordable East Asian meals by shopping at ethnic grocery stores and using traditional ingredients like garlic, ginger, green onions and tofu. At a little Asian grocery store on Chicago’s north side, Douglas Cheok studies the produce as he shuffles down the aisles. The Malaysian-born communications consultant, carefully selects small amounts of ginger, garlic, leafy greens, and soba noodles. Then he stops at a shelf lined with fermented bean curd. “This salted bean curd soaked in vinegar and oil adds a more solid taste to the noodle soup or whatever you cook,” he says sharing an Asian secret to inexpensive flavor. Cheok adds the pungent curd to his cart, grabs a few fresh shrimp and heads to the check out line to buy groceries. It all costs less than $15 but he says it will last well over a week. Once back in the kitchen, Cheok chops, minces, boils and stir fries his ingredients into a large feast of soup, greens and noodles. In the process, he demonstrates what might hold the key to affordable nutrition for all. At least that’s the working hunch of public health professor Adam Drewnowski, who is researching folks who upend conventional wisdom by achieving high levels of nutrition on tiny budgets. Drewnowski stumbled upon the phenomenon last year when he was examining data on nutrient dense foods. Much of it is fairly expensive, but there were a few exceptions. Among a small group of Mexican American adults Drewnowski found consumers who were achieving high levels of nutrition at a low cost. Drewnowski is the Director of the Center for Public Health Nutrition at the University of Washington and he’ll be looking at a different sample of data later this year from Seattle. There he also expects to find Asian immigrants like Cheok. So what is it about these immigrants that allows them to pull off this feat? The folks at Oldways believe it’s about sticking to traditional diets. OldWays is a nutrition non-profit aimed at improving health through heritage. And it urges folks to adopt many of the healthful tenets of Mediterranean, Latin American and Asian diets. This month they are launching classes on the African Heritage diet as well. These diets can be especially affordable in cities like Chicago with abundant, low-cost ethnic grocers. 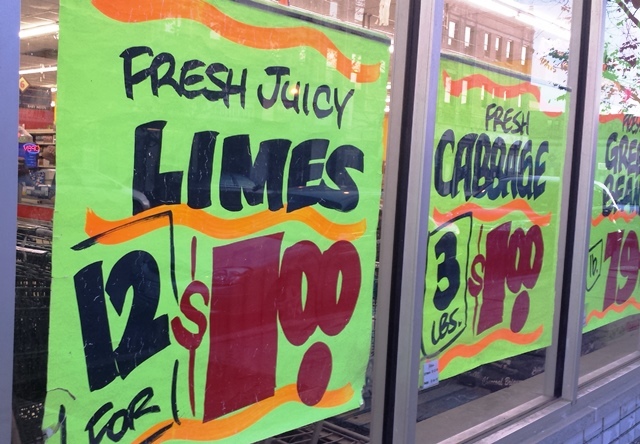 While limes can cost 50 cents apiece at mainstream stores, they can often be 12 for a dollar at ethnic grocers. Kenny Moore is a produce buyer for Pete’s Fresh Market which serves heavily ethnic communities. He says that he’s able to offer bargain prices because he sells such a large volume. The situation in these ethnic neighborhoods would appear to be a public health professional’s dream: affordable, accessible produce and lots of folks who know how to cook it. So does that automatically equal great health? Not always. While Asian-Americans suffer less obesity than the general population, Latinos check in with more. In fact, 6th grade Latino boys suffer from the highest childhood obesity levels in the nation, despite generally robust access to fresh produce. Public health researchers are still trying to sort it out why this happens. “There are plenty of grocery stores in the neighborhood but buying healthy food. It gets tricky,” says Erica Rangel a coordinator for Enlace, a health and education non-profit in the Little Village neighborhood. She recently gathered a group of women enrolled in an Enlace healthy gardening program to talk to about what’s contributing to poor health in their community. Graciela Contreras is a school lunch lady, gardener and grandmother who suffers from diabetes. Ironically, she blames some of the health problems in her community on traditional Mexican foods. Rangel believes the health issues have more to do with genetic factors, assimilation and little time for scratch cooking. The other ladies offered similar sentiments. But I also chatted with local 6th grader Victor Marquez. While he doesn’t have a weight problem, he says he know a lot of boys who do. But what about the fresh fruit stands that operate on nearly every block in Little Village? Don’t his pals buy their fresh cups of mangoes, corn, melon and pineapple? Those chicharrones are deep fried artificial pork rinds and the raspados are snow cones drenched in inky sugar syrup. One vendor told me they’re her No. 1 seller with kids. But there may be hope for these kids off the street and back in the home. Drewnowski has some new research coming out that suggests the longer folks spend cooking, the better they eat. That certainly seems to be true for Douglas Cheok. Back in his kitchen, he’s chopping vegetables and boiling water for his stir fried greens and shrimp noodle soup. In less than an hour he’s turned out enough dishes to last him all week. As Cheok finally sits down to his his meal of shrimp soup and tofu with greens, he shares a startling secret. And it might not hurt to live near an ethnic grocery store.